Do you have children or students who want to be cryptographers (i.e. those who study techniques for keeping messages secret)? Maybe you know youngsters who want to drive an elder sibling crazy by writing notes they can’t read, or have passers-by look askance as they communicate fluently (and loudly!) in Pig Latin. Whatever the motives, codes and cyphers or just speaking gobbledygook have been intriguing we humans for centuries, so why should kids miss out on the fun? Probably the simplest written code for children to use is one where they substitute numbers 1-26 for the letters of the alphabet. A = 1, B = 2 etc. Once children can manage that, they can try starting with M = 1, N = 2 and so on. Friends can each have a copy of the code or perhaps a secret way of indicating which letter is 1. The code my little brother and I confounded our (nonexistent) enemies with was one we called the box code. 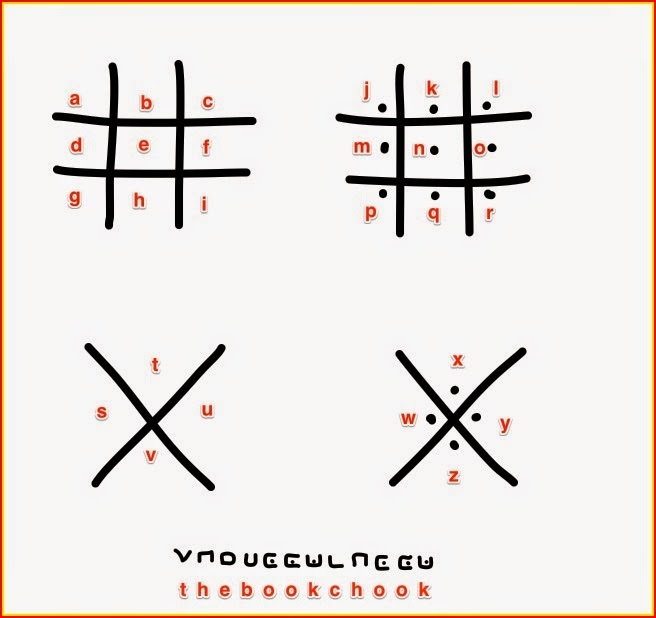 I’ve also seen it referred to as the TicTacToe code. Kids draw four grids. They add dots to the second and fourth grids, and set the alphabet letters into each grid slot. By recording the grid lines and dot (or no dot) near each letter, you get a representation for that letter. Here’s a diagram to help. Here are directions for kids (and maybe a helpful adult) to make a card spy decoder at Frugal Fun for Boys. Using small images or squiggles to stand for letters is one way kids can create their own code. Have them check out dingbat fonts or pictographs like Vincan symbols for inspiration. 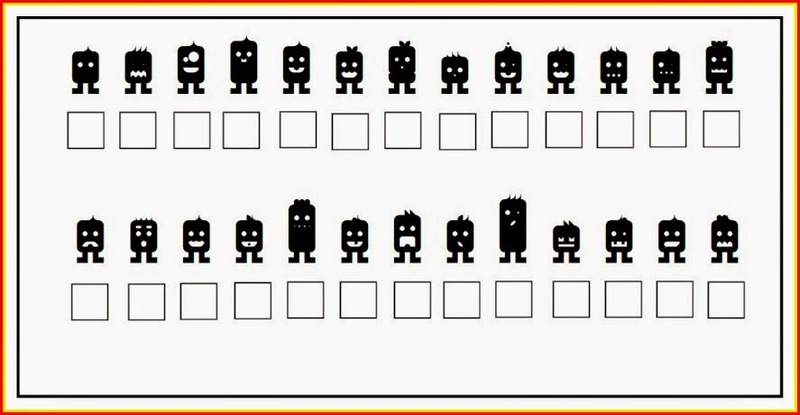 Install a dingbat font they can use, or have them create 26 tiny pictographs. Skitch has special characters under the Edit Menu. I downloaded Monsterz by Fonts of Chaos at DaFont to create the code below. In Word, students could make a table, and insert their chosen clipart or symbols for each letter of the alphabet. Rebus is another way to write in code. With rebus, you need to use a combination of small images and letters to represent words or syllables of words. For example, if I wanted to write a sentence, “You are so wise.” I could write: U R (draw a small image of someone sewing) YY. 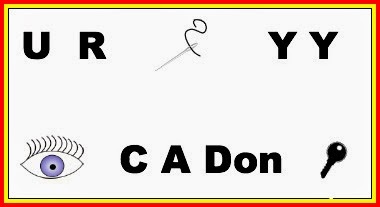 Or “I see a donkey” becomes: (small image of human eye) C A don (small image of key). See image below. You can find lots of rebus messages under these bottle caps. National Institute of Environmental Health Sciences has some trickier ones for kids to ponder. One other example is on Allen and Unwin’s website, supporting Ursula Dubosarsky’s The Cryptic Casebook of Carlo Carlomagno: The Perplexing Pineapple. This adds and subtracts letters from picture clues, perhaps making it easier for younger kids to grasp. Don’t forget Morse code, a system where dots and dashes represented letters in Samuel Morse’s telegraph system. Kids can use a torch or flashlight to send a message with it, or use a sound maker like a flute or even try short taps and longer taps on wood. The Boy Scouts of America have a morse code machine kids can use. Here’s a great page (Flash) where morse code is linked to music. 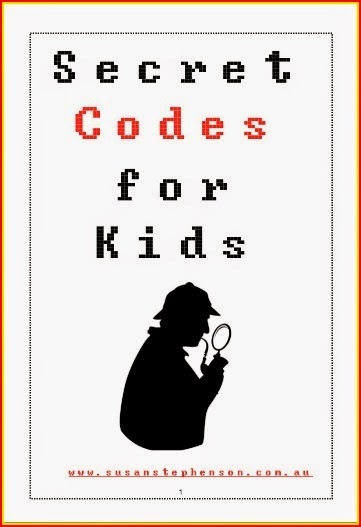 Kids might like to make it doubly difficult for spies to decipher their words by writing them with invisible ink (lemon juice), or keeping the master code in a locked and cleverly hidden box. Gibberish isn’t a code at all. But it’s a great way for children to use all their skills to communicate without words. Basically, they must think quickly what they want to say and then “say” it in nonsense talk. So, one child might come up to another and offer to shake hands, saying briefly, “Ingaba”. The other repeats it, and shakes, fairly confident it’s some sort of greeting. Child 1 follows up with a question, “Zukela garba ding?” Child 2 answers with “Jenka willa ding dong” and holds his stomach as if ill. This makes a nice warm-up for learning the language-related games that follow. Pig Latin isn’t exactly speaking in code, but it’s close - a way of disguising your real speech so only those initiated to it can understand it. Kids do not need to know that sadly, most people DO understand it. I think it’s not only fun, but good brain training to have to visualise a word and change it before speaking. Ubbi Dubbi is a fun language I found out about at PBS Kids. Similar to Pig Latin, in Ubbi Dubbi, you must say “Ub” before any vowel sound. Therefore, “Kids will have such fun with Ubbi Dubbi” becomes “Kubids wubill hubave subuch fubun wubith Ububbubi Dububbubi.” After children have had a try for themselves, introduce them to the cheat’s way - a PBS machine that will translate for them! If the language games above are too easy for your kids, challenge them with Tutnese or Double Dutch. Here’s a wiki entry that explains the rules. Wish them luck! Link codes with even more reading! 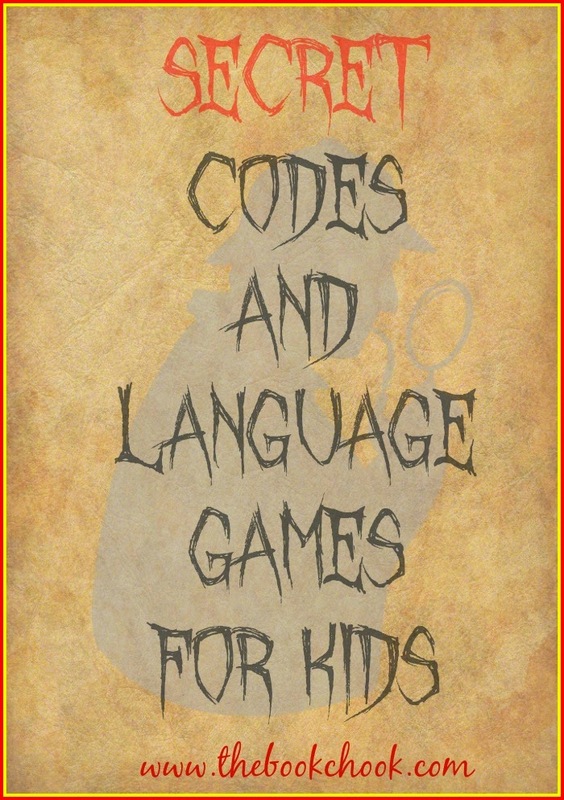 Keep an eye open for children’s books with a code theme e.g. Ursula Dubosarsky’s book, The Perplexing Pineapple: The Cryptic Casebook of Coco Carlomagno (and Alberta) Bk 1, Sally Rippin’s Biliie B Brown Mystery, Code Breaker and Graeme Base's The Jewel Fish of Karnak. Apart from being lots of fun, learning to think cryptically is great training for the brain. One way to introduce children to this kind of sideways thinking, is to teach them how to play games like Hink Pink and My Aunt Likes. You’ll find descriptions of how to play both in the Book Chook Bag of Tricks. Older kids might enjoy an encounter with a cryptic crossword, a wonderful puzzle for exercising the brain.